[Interview] A.C.E talk audition show experience, first impressions, dorm life without Chan, and more! 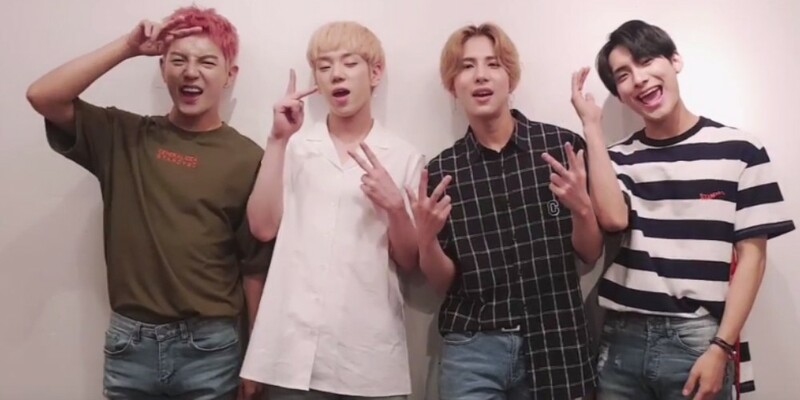 A.C.E is here with the answers to your questions! Donghoon: SHINee's "I Want You"
Jun: Lauv's "Paris in the Rain"
Byeongkwan: iKON's "Long Time No See"
Donghoon: I want to learn photography. I don't want to just pass by the beautiful moments I come across in my daily life. I want to capture it in a photo. I don't know when I exactly started but I became interested so I searched on the internet and on YouTube to teach myself! Jun: Oh, this is what idol trainee must be like! SHINee sunbaenim, who have tried various new�concepts and performances since their debut, is the sunbaenim that we have always admired. Our promotion period overlapped this time so we met them often at broadcast stations. When watching their stages, we realized�that A.C.E have a lot to learn from them. Donghoon: Chan - I think he'll be fun to be around. Wow: Byeongkwan - I think he'll be fun. Jun: Wow - I feel like he'll be very warm and we'll connect well. Byeongkwan: Wow - I think we will get along well. All the members talked about this often and all five of us want to try trendy hip-hop. We think we will be able to see a never-before-seen side of A.C.E (with the hip-hop concept)! Jun: I was proud of all members. I once again realized that they've all started this career for their great love for music. Wow: The responsibility the members have for their performance was greater and more precious than what I've thought. Donghoon: This moment right now might also be your happiest moment. Wouldn't you be happy if you feel happy with the present and live your best?? Wow: You will be able to laugh it off once it passes by! Like how they say time is medicine, I think it will be good for you to take some time off to relax. Jun: Don't make things harder by forcing yourself to overcome the hardship. The hardship is ultimately yours no matter what so it'll naturally improve once you embrace it. Byeongkwan: Not a specific goal but I just hope that I can be satisfied with myself at the end of the year and we become a more relaxed team. To Choice who we love the most! We cannot express the great appreciation we have for you guys in this short message but we can promise you one thing! We will become A.C.E who you can always be proud of and show off about. Thank you for always trusting in us. We love you, our Choice. This was A.C.E ^^!